Spring is just around the corner, and that means it’s planting time for the Nation’s farmers. Many of them rely on high-tech farming practices such as in-depth analyses of soil samples, and prescription application of seed, fertilizer, water, pesticides and herbicides, and more. For all of these applications, three-dimensional elevation data, and a whole host of other cutting-edge information are brought together in a process known as precision farming. Precision farming is just one of many practices that are making use of unprecedented levels of scientific information about the environment and its natural processes. Well-established business uses increasing rely on three-dimensional elevation data, including natural disaster management, infrastructure construction and management, natural resources conservation aviation navigation, transportation planning, just to name a few. One of the most promising realms of this new technological integration is the advance of 3- dimensional elevation data. 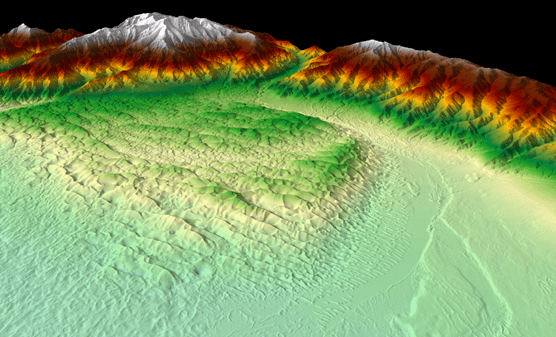 A 21st century update to traditional topographic mapping, 3D elevation data relies on high-tech tools like lidar and IfSAR to produce extremely detailed maps of everything from geologic features to buildings. The USGS, in partnership with several federal, state, tribal, and local agencies, has initiated the 3D Elevation Program, known as 3DEP, which has identified a wide variety of potential benefits in every state. For instance, in Iowa’s corn country, it’s no surprise that 3DEP’s primary benefit is in agriculture and precision farming. By having detailed measurements of elevation, farmers can determine crop rows, crop spacing, fertilizer applications, and irrigation with the utmost accuracy. That makes the entire operation more efficient, yielding more bushels of corn per dollar spent. A national assessment to document business uses indicates that 3DEP could result in at least $18.8 million in new benefits annually to the Hawkeye State. Nationwide, the value to America’s farmers of public domain lidar for all agriculture and precision farming is potentially worth up to $2 billion annually. So what other ways could 3DEP be of benefit to people around the United States? The USGS has just finished the release of fact sheets for each of the 50 states and Puerto Rico that explain those benefits. For example, in late 2015, South Carolina was struck by a nor’easter and rainfall from Hurricane Joaquin offshore, resulting in historic flooding. 3DEP information is essential to applications support both mitigation and preparedness planning. In fact, based on economic surveys, 3DEP could result in $4.3 million in new benefits annually to the state, mostly in flood risk management, agriculture and precision farming, and natural resources conservation. Meanwhile, in the Golden State, 3DEP underpins applications that address wildfire mitigation and response. By mapping vegetation three-dimensionally, it will be possible to predict how fast and far wildfires could spread. In addition, it can help identify areas most at risk for one of the dangerous consequences of wildfires—landslides. Added with 3DEP’s support of infrastructure construction and management and other areas, 3DEP could bring at least $28 million in new benefits annually to California. 3DEP isn’t just good at mapping vegetation; it’s also good at mapping under the vegetation. 3DEP maps can be made to show the underlying topography and land forms in heavily forested areas. This is of special importance in places like Arkansas, where sink holes and fault zones are often obscured by plant cover. By adding this capability, as well as others, 3DEP could bring $7.3 million in innovative benefits annually to the Natural State. At the beach back on the East Coast, 3DEP has great potential in Florida to help with a perennial problem: hurricane storm surge. By mapping coastal land and infrastructure three-dimensionally, disaster planners can more accurately model what will happen when hurricanes strike. That, in turn, will help community planners reduce the overall risk from the storms. With its flood risk management benefits, as well as other applications, 3DEP could bring Florida $10.9 million in new realized benefits annually. Last but not least, 3DEP has great potential for the State of Alaska. Here the most significant benefit (approximately $10 million) would be for aviation navigation and safety. Alaska is home both to the most people with pilot licenses and one of the highest numbers of mountains in the entire country. This becomes a potent and often deadly mix when maps for pilots don’t have reliable elevation data. 3DEP could provide that data, potentially reducing the number of fatal crashes substantially. Adding that to benefits for natural resources conservation, as well as oil and gas development, 3DEP could add as much as $18 million annually in new benefits to the Last Frontier State. The USGS 3DEP initiative is based on the results of the National Enhanced Elevation Assessment that documented more than 600 business uses across 34 Federal agencies, all 50 States, selected local government, U.S. territories and Tribal offices, and private and nonprofit organizations. Based on this cost-benefit analysis, 3DEP is designed to conservatively provide new values of anywhere from $690 million per year up to $13 billion per year in additional benefits through applications that span the Nation’s economy. The U.S. Interagency Elevation Inventory shows that around 14 percent of the lower 49 States and territories have 3DEP-quality lidar data. In 2015, about $39 million was invested in 3DEP data by the USGS and Federal, state, local and other partners to acquire about 150,000 square miles of data – an area larger than the state of Montana. 3DEP is a “Call for Action” because no one entity can accomplish it independently. 3DEP presents a unique opportunity for collaboration between all levels of government, to leverage the services and expertise of private sector mapping firms that acquire the data, and to create jobs now and in the future. When partners work together, they can achieve efficiencies and lower costs so that 3DEP can become a reality for the entire country. When 3D elevation data are available to everyone, new innovations will occur in forest resource management, alternative energy, agriculture, and other industries for years to come.